Most of us know Billy Graham as the self-assured and charismatic preacher who became one of the most important figures of 20th Century Christianity. Now, with the release of Billy: The Early Years, we meet Billy as the earnest and promising young man at the crossroads of faith and doubt, ultimately facing the moment of decision that launched one of history's most powerful evangelistic careers. Most compellingly, Billy: The Early Years paints its portrait of Graham against the backdrop of his relationship with Charles Templeton, another gifted young preacher who's faith could not withstand the onslaught of scientific scepticism. He and Graham parted ways and in the film, Templeton comes to personify the rising tide of disbelief into which Graham launched his crusades. 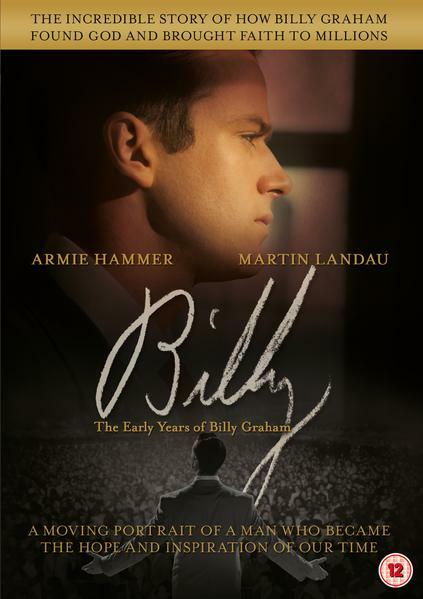 Filmed in Tennessee, Billy: The Early Years captures the feel of the Depression-era tent revival where Graham heeded the altar call, and follows him through the doubt and resolution of the next decade. The film was directed by the versatile actor/director Robby Benson - the voice of The Beast in Disney's Beauty and the Beast. The movie's power lays in its honest portrayal of Billy's struggle with the ideas represented in Templeton's eventual unbelief and shows how Billy's faith, so dramatically portrayed in the film, goes on to change the face of modern evangelism. This is certainly one of the most visual and moving tributes to the man who has brought so many to Christ. Most of the world saw Billy Graham as the self-assured and charismatic preacher who became one of the most influential figures of 20th century Christianity. Now, we meet Billy as the earnest and promising young man at the crossroads of faith and doubt, ultimately facing the moment of decision that launched one of history's most powerful evangelistic careers. The whole movie paints its portrait of Graham against the backdrop of his relationship with Charles Templeton, another gifted young preacher whose faith could not withstand the onslaught of scientific scepticism. He and Graham parted ways and in the film, Templeton comes to personify the rising tide of disbelief into which Graham launched his crusades. One of the major factors throughout the movie is that the Christian faith is held in the highest regard, something that can sometimes be missing from the generation. This is a movie that young people would watch to get an insight into this great man, and older generations would connect with due to growing up seeing and hearing Mr Graham. I believe those who watch this movie will be challenged. Early in the movie, Ruth provides Billy with a sage bit of wisdom: “If you are not willing to live your life for something greater than yourself then life is not worth living.” In his life, Billy Graham followed this advice relentlessly in his pursuit to spread the Gospel message. Billy: The Early Years will leave a challenge in our hearts to do the same.